Before beginning his day, [Richard] needs to decide whether he should ride his bike to work or take the London tube. All the information to make that decision is available on the Internet – the current weather report, and the status of the subway lines and stations he’d be taking. The problem, though, is all these pieces of information are spread out in multiple places. [Richard]’s solution to this was to make a bicycle barometer that pulls data from these places and makes the decision to ride a bike or the tube for him. [Richard]’s barometer is built around a nanode and an old clock he found at a flea market. The nanode queries the UK’s weather bureau and the London underground’s line and station status. All the variables under consideration are weighted; if it’s snowing, the output is much more likely to decide on the tube than if there was a slight drizzle. It’s a really cool build that certainly makes a great use of the publicly accessible APIs made available by the London underground. You can check out a video of the barometer after the break. [Alex] sent in a neat Ikea DIODER build that controls strings of RGB LEDs with HTTP requests. We’ve seen Ikea DIODERs controlled wirelessly and over USB, but using the Internet with a DIODER is new to us. For his build, [Alex] used a Nanode, a small Arduino-like board that has built-in web connectivity. The hardware portion of the build is very simple. A MOSFET controls each LED strip on the DIODER. The stock controller of the DIODER was ditched, meaning [Alex] needed to figure out how to convert an RGB color space to a Hue, Saturation, and Lightness color space “for super-classy fading.” Once that was figured out, [Alex] implemented a 1D Perlin noise function to blend between two colors. Finally, the great EtherCard library was used to turn HTTP requests into dancing LEDs. [Alex] is thinking about building a JQuery webpage so he won’t have to muck around with entering commands like 192.168.1.25/hsl?i=0&h=135&s=90&l=50 into a browser. Without a nice web interface, it’s not as futuristic as [Alex] would like, but it’s still cool to us. 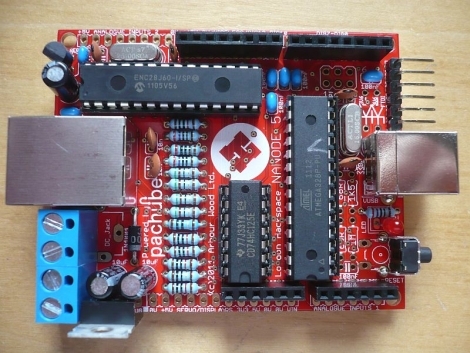 The team at Wicked Device has been working on working on a way to upload Arduino sketches over Ethernet for the Nanode and Arduino Ethernet boards. The team has gotten far enough along to show the world, and the new boot loader shows a lot of promise. A new boot loader was needed to perform this magic. The boot loader sets up a TFTP with a server over DHCP or a static IP. An unmodified .hex file is downloaded from the server and the sketch starts up. The team is still working on a way to push new apps to the board over Ethernet, but that feature is expected to be completed sometime soon. Booting over Ethernet isn’t a new idea – TFTP was proposed for this very purpose. Because Wicked Device’s Ethernet-enabled boot loader only works over a local connection and requires a press of the reset button, it should be considered an alpha build. That being said, the boot loader works as advertised, so check out the demo video after the break.